Just call me a hypocrite, or maybe a convert. Just a few short months ago I told a reader to get rid of a pair of high-waisted cropped wide-leg jeans and now here I am wearing a pair. These aren't the kind jeans that will make my legs look a mile long or my figure a smaller dress size, but the older I get the less I care about following the rules of fashion and the more I want to have fun with the contents of my closet. I met model Maxey Greene through Dia & Co and love following her on Instagram. She was recently in an American Eagle denim campaign and the jeans looked awesome on her. I had heard great things about AE jeans for years but figured as someone old enough to be the mom of their core customer base they wouldn't fit my shape. But they had a sale where their jeans were all under $40 and several pairs under $30. I kept seeing cropped wide-leg jeans in my Instagram feed and wanted to try a pair and figured this would be a good retailer (and good pricepoint) for them. I didn't expect to like them as much as I do. As an FYI, as of last night, AE's jeans were on sale buy one pair and get the second 50% off. I bought these in the faded color as well as ivory. I wore the ivory last Friday with a black fitted tee, black belt bag, and flats to a concert. Sunday, I whipped the ivory jeans out again and wore them with this sweater. 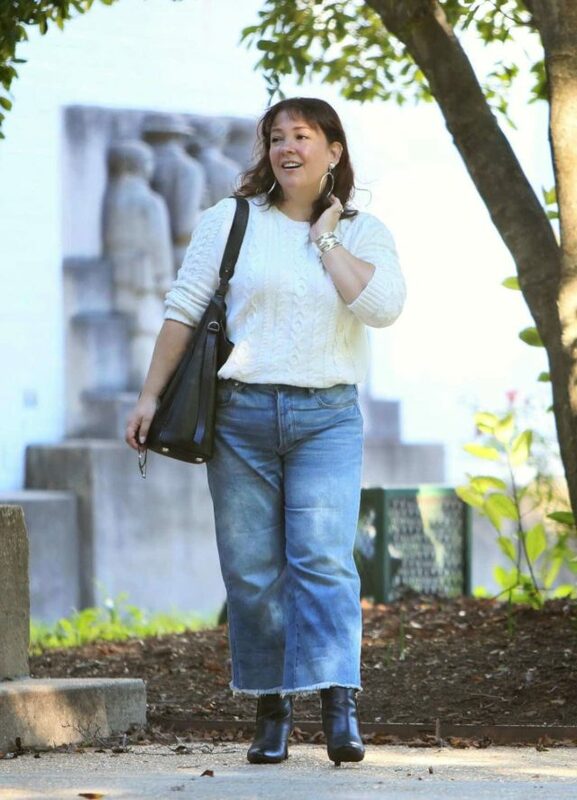 Earlier this week, I wore these faded jeans with a navy cashmere crewneck and black flats. And then the next day I wore them again as seen here with boots. 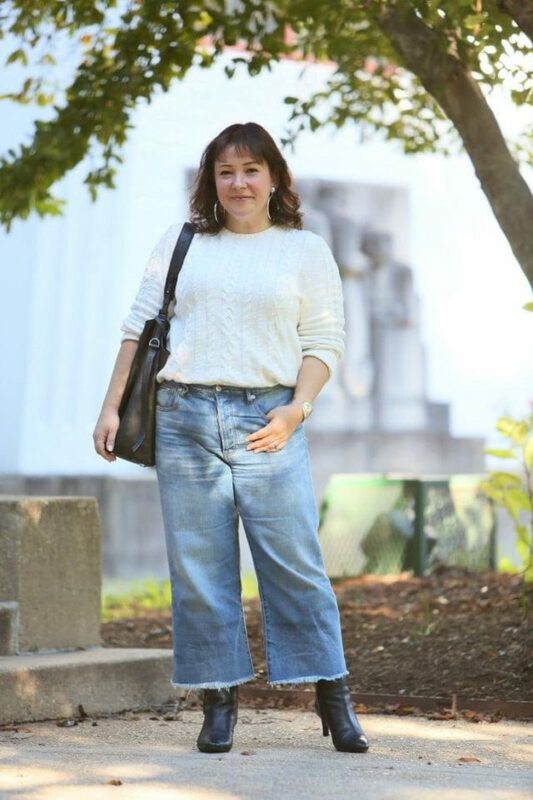 The jeans don't stretch out a lot, they're a nice weight (the ivory is slightly heavier fabric), I'm happy to have found a new denim destination with a great size and length range! The sweater is several years old and a favorite. In fact, I have two ivory cotton cable-knit sweaters (the other has gold buttons up the back) and one up in the attic for if I ever get back to my pre-baby size or Emerson gets big enough to fit into it. It's such a classic that goes with so many personal style aesthetics. Since it's cotton, it's not super thick and can easily be tucked in or layered without feeling like the Michelin Man. The boots are a new purchase. I have boots with a low block heel and a pair of black patent boots with a very pointy toe. I wanted something in between, with a slim heel that would look great with pants, jeans, and possibly even tights and dresses. I ordered ten different pairs of ankle booties, these were the third pair I tried and after wearing them on the carpet at home I boxed up all the boots, even the ones I hadn't opened and sent them back. Clarks does such a great job of making good looking quality boots that are also comfortable and these are no exception! For some reason, I’ve only now gotten around to reading this blog post. 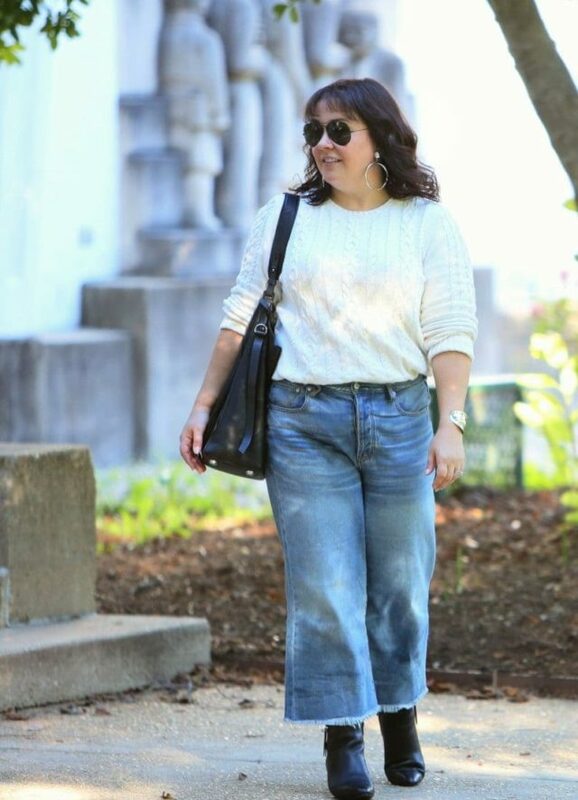 I was chuckling, because I was a member of the amen-choir responding to that blogpost in which you said no to cropped wide-legged jeans, and yet I found myself looking at ways to wear them – or rather, to wear culottes in a different fabric, because I don’t really wear denim (like, ever). Fast forward to last week; I found a beautifully tailored pair of black culottes in a dress-pant fabric at the thriftstore for one euro (that’s less than a US dollar)! i haven’t worn them yet, but I’m planning on trying a few different outfits with them tomorrow. 😀 I know (almost) knee-high boots are not the most fashion-forward thing right now, but I think they will look good with these pants. I may even post a picture in the fb-group if I like it! By the way, i agree that this is not the most flattering look (on anyone, really), but I don’t care..I still like it. I’m a fan of wide-legged pants so I’m happy to see you give them a try. My preferred look is with bare ankles/sandals, but with the weather cooling off I’ve been working on other looks. I’m not a boot person so I’ve been experimenting with a same color shoe/stocking. AE is a store that I often walk though. They do cute windows and that pulls me in. While I’m not much for their bare or too short styles I like their slouchy styles. Although it seems like they’re aimed at Junior sizes I’ve found that they’re target customer is a misses size. Between realistic sizing and a slouchy style things fit — which is always a plus. AE jeans are a great value. I still buy them, and I’m 54! These would not be my favorite for myself, but I’m glad to see you having fun with them. The boots look great on you! I’m glad to have found another denim destination! Love the look on you! I have some which I wear all the time. I’m aware they don’t make my legs look as long as other jeans do, but like you I just don’t care that much. 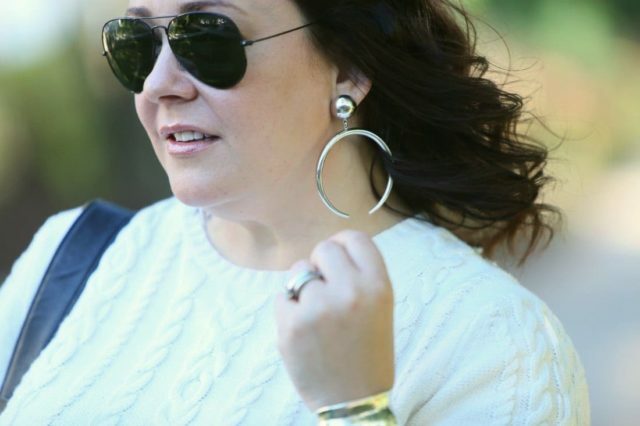 There is really much more to style that choosing the most flattering shape! I don’t like having a bare leg gap after summer is over, so wear fun socks instead. Exactly, I plan to wear this look with taller socks when the temps drop more! 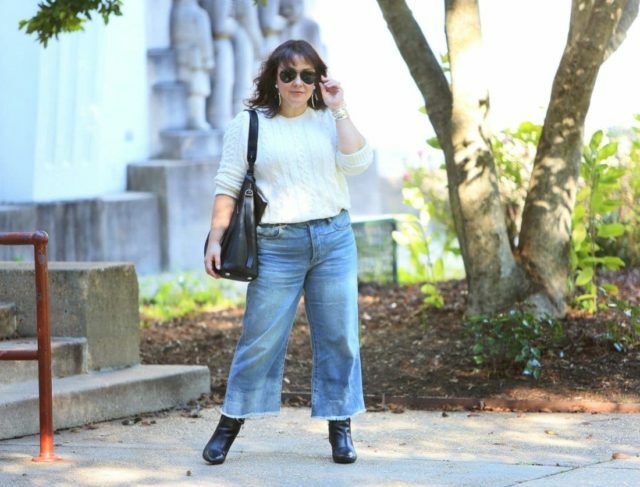 I have a pair of wide cropped raw hem jeans by Eileen Fisher and I wore the *heck* out of them! I’m 5’10” and I wore them mostly with invisible socks and low sneaks or with chunky sandals, and a simple tee or sweater. I did wear them with boots and just wore fun, wild socks in the “gap” between the boot and pant. 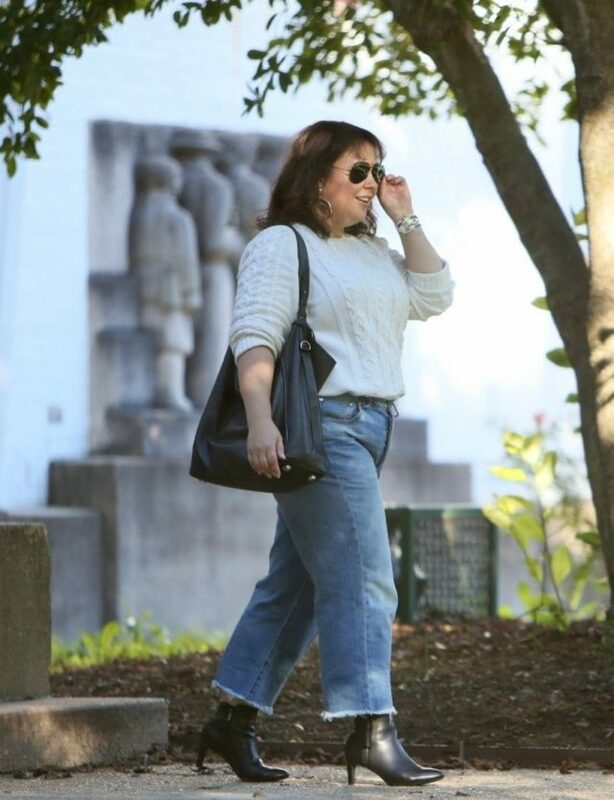 Granted, I am not super into figure flattery but as a full figured size 14, I felt like they looked fun and on trend, and I’m happy to see you rockin’ the style too! Sounds like a great look Naomi! Such a cute look on you, Alison! I love my cropped jeans too. Finish that thought: They look fine. 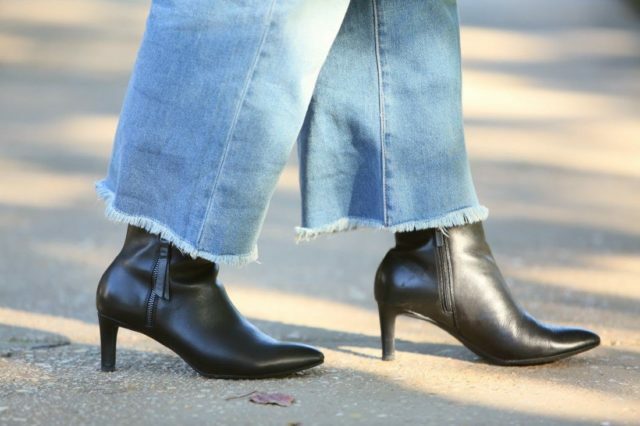 It’s funny I swear I’ve read so many style books and done my research but I’ve always felt cropped was a general term that encompassed any leg length between above the ankle bone to capri. These are the short length, they come in different lengths so I think it could work on a variety of figures. Also this season, there’s cropped pants in such a variety of lengths. I appreciate this conversation, I do think where a pant hits on the leg makes a major difference! No. Not a good look. I’ve loved many looks on you. Not this one. I appreciate you speaking up, Patricia! It’s definitely not a look for everyone and I thank you for your honesty, it keeps me improving!